Drop the word “Tempur-pedic pillows” in any conversation about pillows, and the first remark you are likely to hear is that they are great for neck support, and perhaps rightly so, because they indeed are very supportive. However, that’s not the only benefit they offer. Pressure relief with a plush feel. Works for all sleep positions. In 1960s NASA developed a special type of foam, Visco-elastic foam, to keep their astronauts’ bums cushioned and cheerful during a liftoff. This foam had a unique ability of perfectly contouring to the body’s natural curves, and, in turn, providing great support. Almost three decades after its discovery, Visco-elastic foam was first used in a mattress, called Tempur-pedic mattress, by a Fagerdala World Foams, a Swedish company. 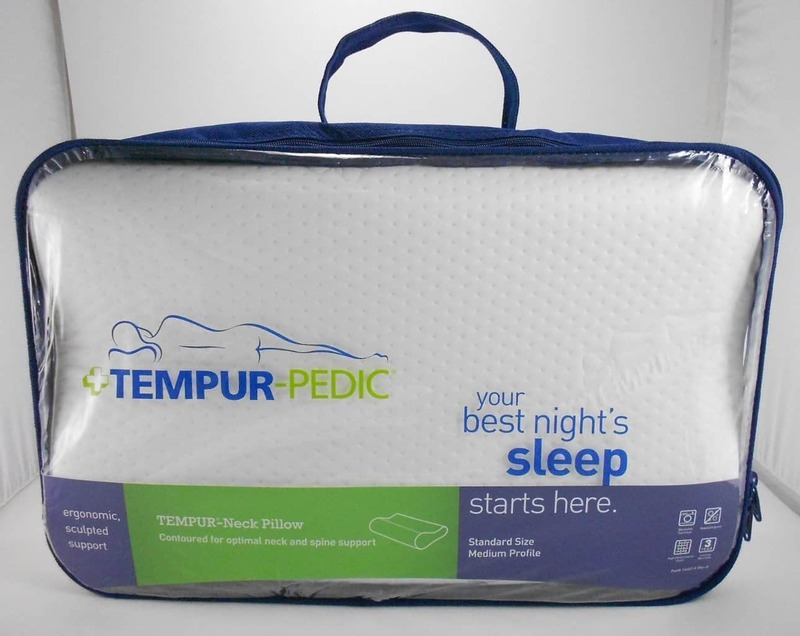 In the USA, tempur-pedic mattresses and later tempur-pedic pillows were introduced by Tempur-Pedic Inc.
Tempur-Pedic pillows are created from the Visco-elastic foam, and the materials that Tempur-Pedic uses to prepare the foam are the same materials NASA used, which, by the way, are a secret. They provide great support. Because these pillows contour to your body, they are able to provide great support to your head and the neck. As a result, the head, neck, and the spine alignment is maintained during sleep. They last for a long time. Thanks to their density, the pillows last for many years. With good care, a tempur-pedic pillow can easily last for as long as 10 years, or perhaps even more. The high-density also allows the pillow to maintain its ability to conform to the contours of the body for a sufficiently long time. Both tempur-pedic pillows and cheap memory foam pillows offer good support, but one big difference between the two is that the latter loses its ability to contour the body’s curves rather quickly. They are hypoallergenic. If you suffer from Asthma or allergies, you can safely use these pillows. The new foam takes some time to break in. New tempur-pedic pillows are really firm, and you many not enjoy sleeping on them for the first few nights. However, within a few days, maximum a week, these pillows break in nicely and gain optimal firmness, enough to provide great support but not so much that you feel like sleeping on a hard rock. They are not as breathable as some other materials. While tempur-pedic pillows are more airy than memory foam ones, they are not as breathable as some other pillow types, for example, down pillows. If the room temperature is high, they may get a little too warm for comfort after a few hours of use. First thing first: there’s no magic formula to make the smell go away in an instant. These three steps, however, help you get rid of the plastic-like smell a little faster. Air out the pillow in open. For a few hours, air out your new tempur-pedic pillow in the open, for example, balcony. If that’s not possible, let it sit close to the window with the ceiling fan in a room for some time. Sprinkle baking powder all over the pillow and let it sit for a couple of hours if the pillow still smells after it has been aired out. Then brush off the baking powder using an upholstery brush attachment. To get the best results, sprinkle directly over the foam, not on the pillowcase. Use a room freshener. Vinegar is good option here. Keeping a bowl of it in the room will help remove odor in the air. Tempur-pedic pillows offer good support and help relieve neck pain, but for best result, you must pick the right one. When buying a new pillow, it should be a good fit for your sleeping position. If you are a side sleeper, you’d like to buy a thick pillow to ensure your head is propped up nicely. You must also consider how you’d be using the new pillow. 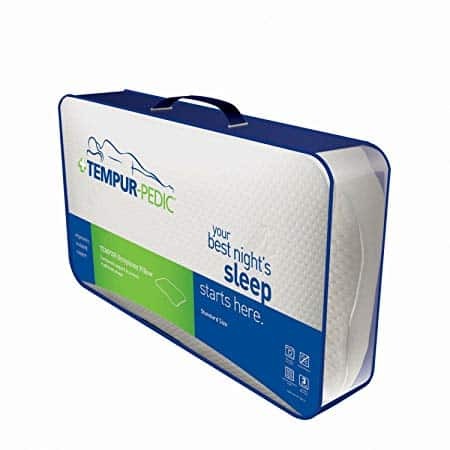 If you would be using one pillow for sleeping, reading, watching TV, and travelling, you’d be much better off by buying an all-purpose tempur-pillow. Another thing to consider is firmness. While all tempur-pedic pillows are firmer than down, feather, buckwheat hull, and synthetic fiber fill pillows, some of them are firmer than others. Pick a pillow that has the right firmness for you. This pillow is medium-soft yet gives great support to the neck. Those who like soft pillows will be pleased, because this is not a common combination, as most foam pillows that provide good support are a little firm. Because of its size, the pillow works best for petite people like me. Big, burly guys might want a bigger, thicker pillow. You can use it for back, side, or stomach sleeping. However, it works best for back sleeping. Most people might find it is not thick enough when used alone while sleeping on side. With that said, using a thin pillow underneath it works out perfectly here. Thanks to its hypoallergenic cover, the pillow is a good choice for all those suffering with asthma or allergies. Another good thing is that the cover is removable and machine-washable. My only gripe is that it doesn’t come with a pillowcase. If its shape were not unusual, that wouldn’t be a problem. But it is, so you might have to struggle a bit to find a decent pillowcase in case you need one. The pillow features a unique dual-sided design, with a separate side for back and side sleeping. Dual design, however, is both an advantage and disadvantage. On the one hand, you get optimal support in two sleeping positions (something that most pillows don’t offer). On the other hand, to enjoy the benefit, you must flip the pillow each time you change your position. This, however, might not really happen when you are in sleep. So you might actually end up using the wrong side, which, in turn, might disturb your posture and cause discomfort. One big drawback is its smell, which doesn’t fade away in a hurry. Mine smelled pretty strongly for nearly two weeks, after which the smell thankfully faded away. Click here to read more reviews​ on Amazon. 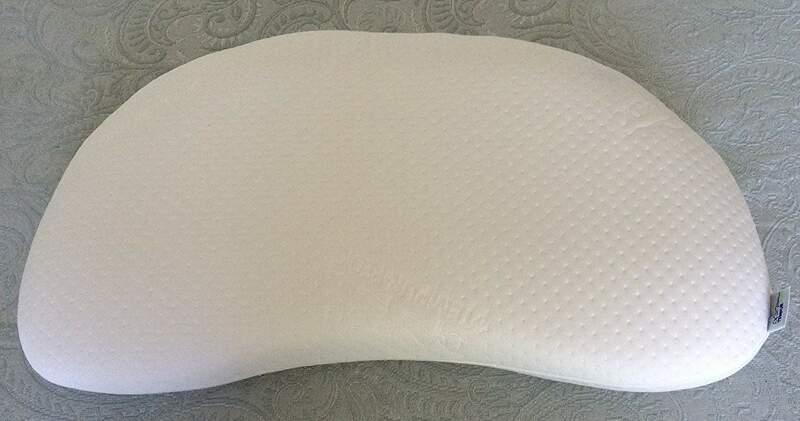 This pillow provides better neck support than most others, to a great extent because of its right firmness. It is neither too firm nor too soft. It features a contoured design, which helps maintain alignment of the head, neck, and shoulders. Those suffering with kinks in neck or chronic neck pain might benefit from using it. The pillow is suitable for both back and side sleepers. Stomach sleepers, however, may not find it suitable. The pillow is dust mite and allergen resistant, making it a good option for asthma and allergy sufferers looking for a pillow for neck support. Another advantage is its cover. You can remove and wash it in the machine whenever you want it. Like any other Tempur-Pedic pillow, this one too smells pretty badly when new. It will be a couple of weeks, or perhaps more, before your NeckPillow loses its smell enough to not bother you. Most side sleepers might love this pillow as it gives good support to the neck. With that said, you might take some time before you start enjoying it. Initially you might find the pillow too firm (because it actually is). However, the firmness reduces to a level where the pillow becomes very comfortable to use in a few days’ time. The SidePillow features a 75% cotton and 25% polyester cover, which is comfortable and soft to touch. The cover is dust mite and allergen resistant. Those with asthma or allergies can safely use the pillow. The pillow cover is also removable and machine washable. There is no escaping the strong plastic smell of tempurpedic foam. It hits your nose hard when the pillow is new and continues to be a bother for at least a few weeks. I could use my pillow comfortably only after 3 weeks and I don’t have the strongest sense of smell! The strong and stubborn smell notwithstanding, this pillow is a quality product. You might want to try it out if you’ve pain or discomfort in the neck or shoulders. Although this multipurpose pillow is quite firm, it is comfortable to use. Like all other Tempur-Pedic pillows, this pillow too feels pretty hard when you first take it out. However, in a few days, the foam breaks in and becomes comfortable. It provides great neck support and can be used while reading, travelling, watching TV, and even sleeping. You can also use it under the knees. Most users will find its size just appropriate. However, if you are big and burly type, it may be a bit small for you. Its cover, 75% cotton and 25% polyester, is both breathable and comfortable. You can throw it into the washing machine whenever you think it requires a cleaning. The other good thing is that the cover is dust mite resistant, besides being hypoallergenic. If you have asthma or are prone to allergies, you can use it without a worry. 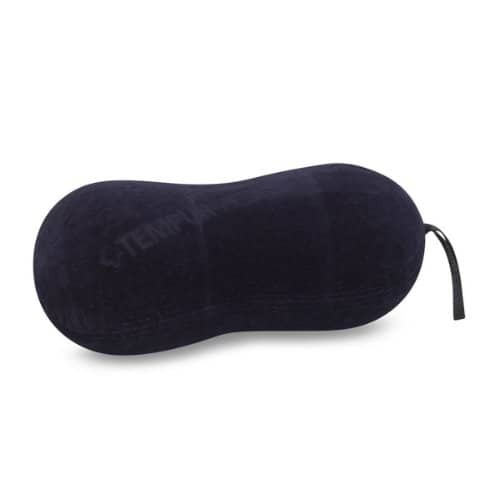 All Tempur-Pedric pillows smell quite strongly when new, and this one is no different. You’ll have to live with it for a couple of weeks. Besides that, this is a good multipurpose pillow. Click here to read more reviews on this pillow on Amazon.